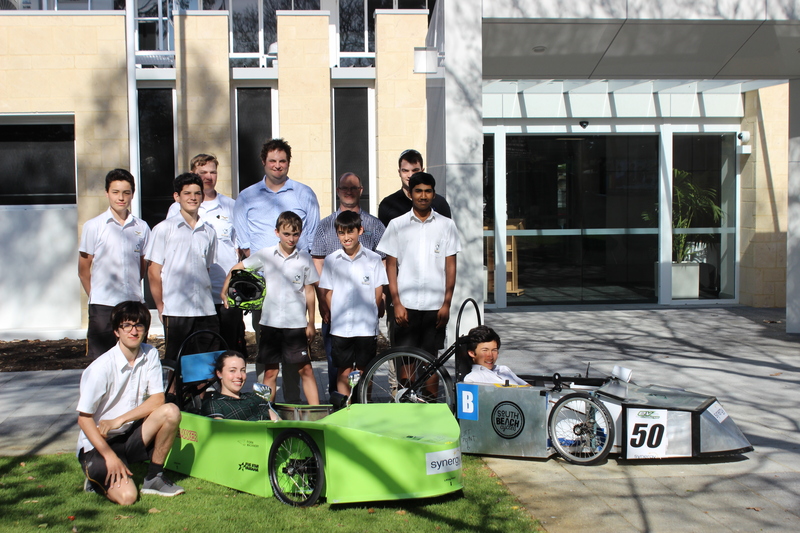 In week 4 pf Term 4, Melville SHS won the Class A Junior School Ev Challenge, an electric car race meet held at Wundowie racetrack. The drivers on the day for the winning team were Year 7 students Aaron Benness and Stephen Phillips and Year 8 Brian Caffrey. Other students in the group were: Crest Flanders, Jonathon Phillips, Emma Collins, Marcus Robertson-Wall, Steven Philips, Aaron Bennes, Tasman Thurstun and Lithesh Manivelan. Over many months the students built their cars and engine before school at recess and lunch with teacher supervision. Schools then compete at the yearly event to see who manages to balance pace with conservation of the battery life. The car that travels the furthest is the winner. This event is an educational activity to enhance the STEM subjects of Science, Engineering, Technology and Maths and is a long term commitment from teachers and students. They put skills and concepts into action, work together as a team to solve engineering problems and design solutions evaluated in the most unforgiving of arenas – competition. External educators were invited to come to the school on several occasions to demonstrate various braking designs, machine operations, driving skills, electrical wiring and calculations, regenerative braking, electrical formulas etc. This year the students got up early to be at the workshop every morning at 8am to review the progress of the EV and every recess and lunch for briefings. Thanks must go to companies that helped out such as South Beach cycles, Fiora Machinery, 5 Star Yamaha, Designs by Nat and Curtin University. Class B (Senior) placed fourth in a large field after a blown tyre in practice which saw them start in 25th place. An amazing recovery given the start. Drivers were Kadin Gallant-Harvey Chloe Back and Crest Flanders. Class C (Open) placed fourth in the first race of the day after being delayed with technical difficulties (a blown fuse). Another outstanding recovery given the start with some slick driving by the team. Hayden Lock, Matt Lord and Greg Allin were the drivers. Behind these drivers there is a larger team of students who have worked throughout the year every Monday and Thursday to design, build and test these vehicles. Teachers Mr Dion Manby, Mr Matt Lord and Mr Greg Allin again lead the successful event with many hours spent to conceive, design, build and then race the machines. Students Chloe Back and Kaden Gallant-Harvey achieved a Certificate II in Engineering, which is normally a two year course, however they have outstandingly complete the course within six months. Ethan Rowcliff and Callum Vincent achieved an additional Endorsed Course for 2018.